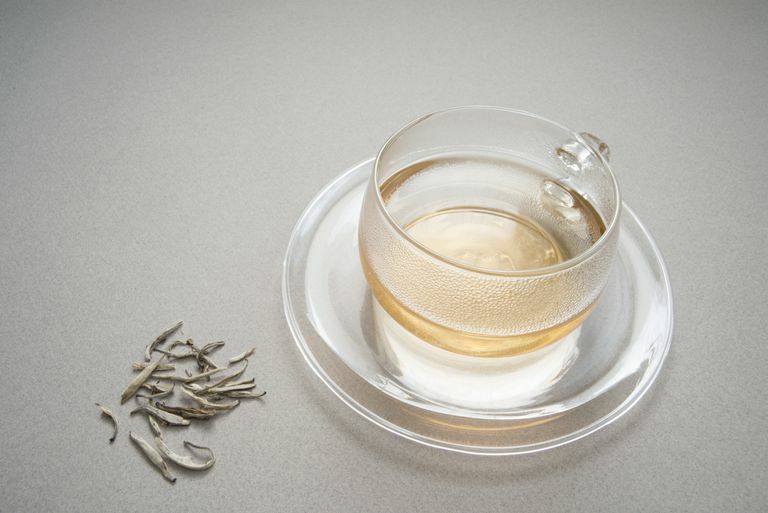 White tea is a delicate tea that is gaining in popularity. In addition to boasting greater antioxidant activity than its green and black counterparts, white tea also offers the least amount of caffeine, making it a smart choice for tea drinkers who prefer to avoid or limit caffeine consumption. Like green tea and black tea, white tea comes from the Camellia sinensis plant, an evergreen bush native to China and India. The use of white tea dates back to the Song Dynasty (AD 960 – 1297). Commercial production of the tea began in China in the 1700s. Today, traditional white tea is harvested each spring in the northern district of Fujian, China. Unlike other types of tea, there is no heating or oxidizing involved in its preparation, so white tea is recognized as the least processed tea variety. White tea is known to have a delicate flavor and there are several different varieties to choose from. Once quite expensive and hard to find in the U.S., white tea has become more affordable and commonly available in recent years. In fact, you should be able to pick up a tin of the tea at your local supermarket. In general, it is smart to use spring water if possible when brewing white tea. Measure about two grams of loose leaf tea per eight-ounce cup of water. Given its remarkably delicate flavor, it's best to steep white tea in water with a temperature of 170 to 185 F (76 to 85 C). Many sources note that white tea can be steeped a little longer than other (stronger) teas. Some say that you should steep for only 2-3 minutes, while others recommend a steeping time up to five minutes. You can experiment to find the steeping time that provides the flavor you enjoy. Because of the delicate flavor of this tea, it is recommended that you enjoy it without milk, cream, sugar, or honey. White tea offers the least amount of caffeine as compared to other popular teas like green tea and black tea. However, the actual caffeine content in white tea can vary based on the plant and the region where the plant was grown. Traditional Fujian white tea is known to have a low caffeine content, but there are other tea plants grown around the world that may provide more caffeine. Other factors may also influence the caffeine content. If you buy your tea in a local tea shop, your vendor may be able to provide specific caffeine information for the tea leaves you choose. Although white tea isn't as well-studied as green and black teas, there's increasing evidence that the brew can enrich your health. Research is ongoing. More studies are needed to confirm these health benefits. For a 2009 study, researchers tested white tea's anti-obesity effects in a series of experiments on human fat cells. Results showed that white-tea extract prompted fat to break down in existing fat cells. What's more, white tea seemed to reduce the expression of genes crucial to the growth of new fat cells. While the study's authors suggest that white tea may be "an ideal natural source of slimming substances," scientists have yet to explore whether the tea could fight obesity when sipped (rather than administered directly to cells in a lab). White tea may hinder DNA mutations (potentially cancer-causing changes in genetic material) even more efficiently than green tea, according to a 2000 study that tested four white tea varieties (Silver Needle, Flowery Pekoe, Mutan White, and Exotica China White). In an animal-based study published the following year, researchers found that white tea may be a powerful inhibitor of aberrant crypts (a precursor to colon cancer). Topically applied white tea may improve the immune function of skin cells and protect against harmful ultraviolet rays, a 2003 study suggests. It should be noted that the study was funded by a skin-care company that manufactures white-tea-based products. Due to the limited research, it's too soon to recommend white tea as a treatment for any condition. It's also important to note that self-treating a condition and avoiding or delaying standard care may have serious consequences. If you're considering using it for any health purpose, make sure to consult your physician first. Any beverage with caffeine may provide side effects to some consumers. According to FDA sources, a typical cup of green or black tea may contain 30-50 mg of caffeine. As noted, white tea is likely to have less caffeine, but the amount may vary. The government organization says that consumption below 400 milligrams a day is generally not associated with negative effect, but sensitivity to caffeine varies from person to person. Baron ED, Swain FR, Matsui M, Marenus K, Maes D, Cooper KD, Stevens SR. "Efficacy of Topical White Tea Against Uv-Induced Langerhans Cell Depletion and DNA Damage in Human Skin. " University Hospitals of Cleveland/Case Western Reserve University, Cleveland, Ohio; and Estee Lauder Companies, Melville, New York, USA. 2003.